At least someone gets to enjoy the heat. Beautiful haiku as always. Thank you. I see the turtles emerge from the lake behind my house and either sit on the banks or simply poke their nose up from the water. It's a very calming thing to watch. Still, they spend most of their time underwater, and I sometimes wonder if their shell needs constant soaking to be able to withstand the hot Florida sun. I could not stay out as long as they do but of one thing I am certain. My skin would turn into something as hard as their shells if I did. Great haiku. And soaking it in. Nice one. Very nice. That turtle knows what's coming in another month or so. Seems to be enjoying the heat. each offering sweeps me away! i feel opened, delighted, nurtured and fulfilled with each unique offering. yours is no exception. i can feel the weight of summers heat balanced on this turtles willing shell. He looks like he is doing yoga. Fantastic. I remember as a kid sitting on the banks of the Russian River and hearing the plop of turtles cooling off from their long sun baths... love the line drenched in heady light... beautiful! I love these creatures, so calm and knowing. I have seen some lately basking on rocks in the sun. Ahhh little turtle is enjoying the warmth. Love the look on it's face. These are my favorite turtles. I've raised several. Great closeup. Go with the flow, no rushing just relaxing and enjoy Mother Earth's nature and wonderful gifts. Such a cutie! Glad to see otehrs enjoying summer as much as I do! I wonder how many days of warm summer rays we have left this year? Nicely written and that turtle sure looks content. Oh, to be him for awhile! great pic, I love turtles! I'm late visiting 'the haiku circle' but I thought I'd better take the time a few days later then hurry through everyones post... 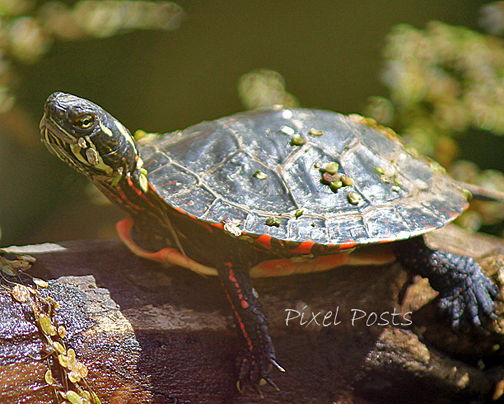 I love the bright, red spots on the turtle's belly... great haiku!